Midori Kai, Inc proudly donates 100% of their annual proceeds from the Midori Kai Arts & Crafts Boutique, as well all other Midori Kai community events to their Midori Kai, Inc Foundation. 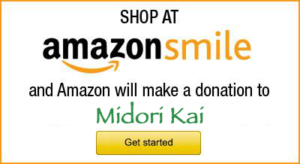 The Midori Kai Foundation was established in 2004 to ensure that Midori Kai will always be able to support various local non-profit organizations that align with Midori Kai’s Mission Statement. Thanks to our generous sponsors and donors! The annual Midori Kai Boutique is our primary — and often singular— fundraiser. As a non-profit corporation, Midori Kai donates a portion of the boutique proceeds to selected non-profit organizations for a two-year period. Learn more about becoming a sponsor. In the search box, please type in “Midori Kai, Pleasanton, CA” and choose this organization for future purchases. Midori Kai is now enrolled in the eScrip program! This is “free” money for Midori Kai, which means additional dollars for Midori Kai to donate to organizations in our community throughout the year. Once you sign up, Midori Kai begins receiving funds from the merchants where you shop. Or, if you are already registered, please add Midori Kai to your profile so we will benefit from your purchases. Also, there are hundreds of name brand merchants online. Midori Kai can earn up to 10%, or more, when you shop at the eScrip Online Mall. You’ll find a link for the eScrip Online Mall on the eScrip home page. Lastly, you can contribute up to 5% of your entire dining bill at thousands of restaurants across the country through eScrip Dining. You’ll find a link for the eScrip Dining Program on the eScrip home page. It is very easy to do and again, it is “free” money to benefit our organization. All monies earned are donated to non-profit organizations in our community. If your company has a Matching Gift Program, please consider Midori Kai as a recipient of a matching corporate gift. All donations will be included in our annual non-profit grant program or our endowment.